Airliners.net • Irish 6/18: Eastern Magic! Good morning folks and welcome to our June thread. This is going to be a historic month. For the first time ever, Ireland has a link to not just one, but two major Asian cities - Hong Kong and Beijing. This evening (our time), Cathay 306 will be taking off from HKIA and heading in our direction - also our first A350 service. Thankfully, bookings are looking very positive, so hopefully this will build up to a daily service. Looking forward to a good month ahead! Re: Irish 6/18: Eastern Magic! I wonder how effective these new no frills fares from United will be in competing against Norwegian. Just hours away from the new CX HKG service. The loads for tomorrows flight are very good. Hopefully this is going to be the trend. An Aer Lingus flight from Dublin to Milan diverted to London Gatwick on Thursday morning after an emergency was declared on-board. A spokesperson from Aer Lingus confirmed to JOE that a medical emergency was declared on-board the flight and the plane landed safely at Gatwick airport. The passenger was taken from the aircraft at London Gatwick to receive the necessary medical attention. DUBLIN AIRPORT HAS been apologising to travellers and assuring them there is “no evacuation” after a broken PA system became stuck on evacuation mode. The problem has occurred in the departure gates area in Terminal 1 with passengers complaining that staff did now know what was happening. Attention please, attention please. We are responding to an alarm activation. Please evacuate this area immediately and follow the directions of airport staff. With the ramp congestion of the last couple of days there’s going to be some amount of delays, 3 in case the early EK & FI yesterday, DL BOS today. Finnair sending A321’s recently, and most LH FRA are A321 too with some MUC. WOW’s morning flight mainly A321 also, as well as LX ZRH flight. Was surprised to see so many 321’s today! Slightly off topic....I was at LHR T2 a few days back and saw this retro bird from a distance and was like wow what’s that. When she finally taxied by it was the Art Lingus retro A320. Wow beautiful plane!!!! Will they? The order was always due for delivery beginning in the second quarter and continuing throughout the year and into the following. And.....it’s off. CX301 (B-LRI, A350) has just left HKG for DUB. And it has arrived safely! CX 301 landed at 6.25am. And Belfast International, on the same day. The two flights landed within six minutes of each other. The Cathay loads and yield is quite good - which is excellent to see. Brussels on the other hand is really struggling. I’m on BRU ->HKG today - 4 return seats just over €1,200 booked a week before departure. Fantastic value. I’m back in Europe next month and the return, non stop, ticket HKG BRU is just €420 peak season. Dublin in comparison was €900. The embassy and tourism Ireland have done a superb job at awareness in HK for the route. Bravo. 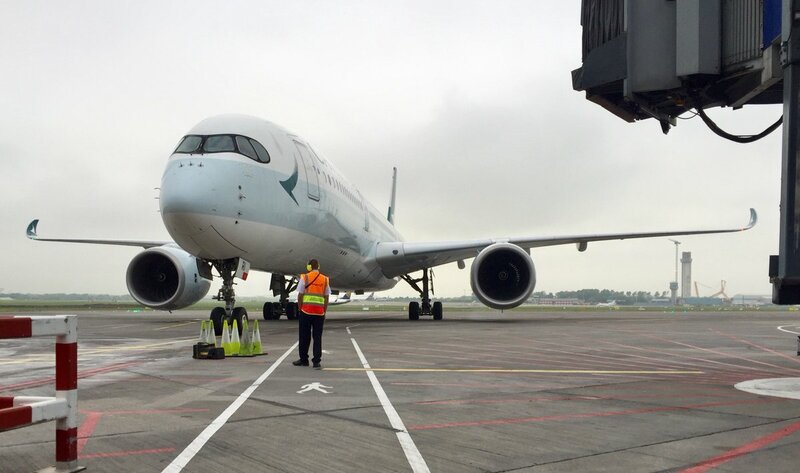 Fantastic to see Cathay and the A350 in Dublin, slight problem with the jetbridge as it couldn't reach the height of the door, passengers were kept onboard for quite some time until the engineers arrived to sort the issue..
Dublin Airport continued to grow faster than its counterparts in Cork and Shannon in the first quarter, growing more than 4%, according to official figures. CSO statistics showed just over 6.9m passengers passed through the five main airports in the first three months, an increase of just under 4% over the same period in 2017. Shannon arrested its decline of recent quarters, increasing its numbers by 2% compared to the same period last year. However Shannon’s 277,000 passengers in the first quarter of 2018 were down from the same period in 2016, when almost 283,000 were recorded. Passenger numbers also increased in Cork and Kerry in the first quarter, while passenger numbers decreased in Knock, the CSO said. Dublin Airport accounted for 87% of all air passengers in the first quarter of 2018, the figures show. Kerry saw the biggest growth with an almost 11% rise to 65,000, compared with the same period in 2017, while Cork expanded almost 2.5%. More than 54,600 flights were handled by the five main airports in the first quarter, with Dublin accounting for almost 85%. London-Heathrow, London-Gatwick and Amsterdam-Schiphol were the most popular routes for passengers for Dublin Airport in the first quarter of 2018. The load is looking good on the DUB route at least in Y yes. Just looking at the summer peak of July-Sept and just on ex-HKG tickets, looks like the lowest summer Y fare tickets are pretty much sold out already which is slightly early for a European route. Comparing to a number of other European routes the fares are tracking on average at least which is good especially given it is a new route. Granted I just looked at the summer though, but CX should have a pretty good idea on how far fare drops off in autumn and winter if they look at their own LON and MAN data. However, obviously need to consider J class and cargo as well to get the full picture. Great to see AC back at SNN and the new DUB-YUL starts tomorrow. Video of the takeoff of the inaugural CX306 - made it off the ground no problem! Welcome Cathay! I’m glad to see DUB “too short” runway was long enough. I rather suspect it was commercial ambition and marketing ability that were too short. Potential all three AC liveries, assuming the A330 is in the toothpaste colours. A359 is the first ULH aircraft capable of getting out of DUB at MTOW, A340, 747, B777 and A380 cannot, so it is too short for ULH routes not on A359. Unfortunate that Aer Lingus wont be getting A350's for the foreseeable future, its looks are starting to grow on me. Hopefully Thai or Singapore will follow Cathay's lead next year. 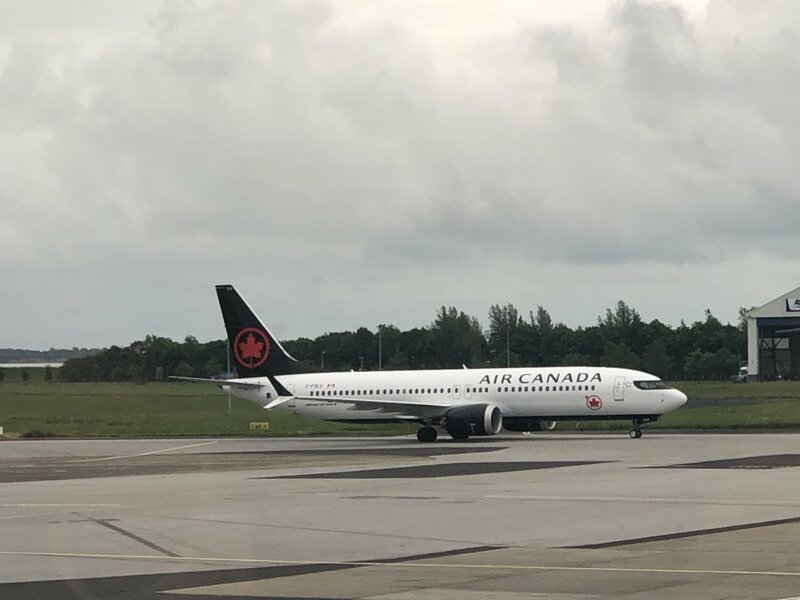 Great to see Air Canada back in Shannon. The A321NEOLR / 737 Max could be a real game changer for Shannon. Maybe an ideal option for EI . - Asian routes also being targeted by EI as per Willie Walsh. Jetex will open a new FBO adjacent to the main terminal at the Dublin Airport. Private jet traffic is around 3,500 departures a year and is expected to grow at a steady pace. Personal info request on transfer time at LHR (not having traversed terminals there in many years). Arriving on AA to LHR T3 @ 12.15 and departing from T2 with EI to SNN at 13.45. Is that 1.5 hours sufficient? Arrival time history for my particular AA flight looks excellent. No checked luggage. LHR website recommends 1.5 hrs using transfer buses. Online blogs suggest walking from T3 to T2 taking minutes. Thoughts and recommendations appreciated. Same question on 2.20 transfer time on return flights (EI into T2 @ 9.05 connecting to BA from T5 @ 11.25). BTW fares from DFW via LHR to SNN/DUB in the excellent new AA premium economy cabin for the T/A legs are marginally above regular coach/economy especially using BA.com. @IrishTexan - you'd be cutting it very fine there. Then again, airlines normally don't advertise connections with insufficient time, so you could give them hell if it all went wrong. To be fair, just from my own perspective, 1½ hours is much less than I would be comfortable with. In any case, I wish you good luck with your journey. 1.5 hours for a connection at LHR is fine. I’ve made terminal-to-terminal transfers and been through security at the other side there before in under 30 minutes. Thank for that. That's pretty much what I recall, but that was in the 80's/90's. I think you are cutting it very fine and I would avoid this if on separate tickets. I did a T3-T5 early morning transfer a few months back and between UK immigration, the bus transfer and re-clearing security it took a good 90 minutes by the time I was in the departure lounge at T5. I wasn’t hanging around, but early AM is peak arrivals at T3 and T5, as well as peak O&D departures. The queues for EU and non-EU passport holders are enormous and slow. Security was similar. How long is the wait for the next flight? Travelling on through booking DFW/LHR/SNN. There are 4 daily flts DFW/LHR and specifically chose to avoid the earlier LHR arrivals at 06:55(T3),09:00(T5) and 10:25(T3). Hoping the 13:25 arrival into T3 avoids the busiest time of the day, and that T3 to T2 transfer runs smoothly. EI also has later departure at 19:35. Ireland West Airport has been granted funding for a crucial runway rehabilitation and overlay project but has made an application to the EU for an exemption under State aid rules to allow for an increased level of aid. Aer Lingus remains confident that its expansion plans for next summer will not be hindered, despite production delays at Airbus that could delay its new fleet of long-haul aircraft. Asked to comment, Aer Lingus chief corporate affairs officer Donal Moriarty said: "Whilst Airbus is experiencing some production delays on the A321neo LR aircraft, we will work with our leasing partner and with Airbus to minimise any delays to deliveries to Aer Lingus. We do not expect our first deliveries to be delayed to the third quarter of 2019. Similarly, we expect there to be no impact on the timing of any announcements of new routes." But he said the airline was concerned about significant capacity constraints in Dublin: "The airport is full. Urgent steps therefore need to be taken to address the infrastructure deficits at the airport. Prior to the delivery of such infrastructure, significant process improvement and optimisation of existing infrastructure is required to address the congestion and to facilitate growth." This is huge. Aer Lingus really needs to diversify and spread its risk - for too long, it's simply been focused on the US, which will continue to require more and more 'mass' (routes and capacity) to grow (which DUB simply doesn't have the space for, or at least soon won't). The US is also going to see more competition, as more and more narrow-bodies plug gaps (think JetBlue as one big risk for Aer Lingus). In contrast, one or two routes to Asia won't require so much of that 'mass', while offering the long-term growth potential to become higher-yielding, as well as less exposure and risk to an LCC or narrow-body operator coming in and stealing the thunder off Aer Lingus. If we're talking about the 332's, then PEK, ICN and NRT should be in the running, and possibly PVG and BKK (I'm not so sure about range and take-off performance, for these latter two). IMO, the big prize will be SIN, and a tie-up with QF or SQ from there down to Australasia (where there are 100,000 Irish-born individuals, within which Aer Lingus has a strong brand affiliation). That would probably only be do-able with the 359, which of course, Aer Lingus is now not getting. I don't see KUL (too small) or HKG (too competitive, with Cathay Pacific) working for Aer Lingus. If 'Asia' includes India and the Middle East, a 321NEO flight to DXB, perhaps? Aer Lingus will resume DUB-EDI from 28 October operating the 06.40 departure ex DUB on (Su,M,Th,F). Would expect daily from March 2019. Not a big surprise given they had started to run x2 ATR's in the morning to cater for demand over the summer. I think in my mind, the major difficulty going into Asia for Aer Lingus will be brand recognition. 100k Irish in Australia, yeah, it’s s good start, but it’s sure not gonna keep any route alive for more than a few seasons. My fingers are crossed that the shamrock goes East! I think in my mind, the major difficulty going into Asia for Aer Lingus will be brand recognition. Brand recognition is not the be all and end all - look at NZ, who had zero brand recognition in China, and who now have made PVG profitable. The same can be said for IB, who didn't even fly to Asia recently, and who are now making multiple Asian routes work, with heavy competition. Cargo and package tours (both of which are huge for Asian traffic) do not rely on brand recognition to the same degree as normal sales would. ... and even if brand recognition was seen to be the biggest risk, EI has options to mitigate that risk, like through a revenue-sharing local JV? Aer Lingus going east will most probably be TLV, DME and Turkey to begin with. The North Atlantic feed will ensure viability. The proposed location for the Dublin Airport MetroLink train station is too far away from both terminals, undermining its potential use by travellers, the Dublin Chamber has warned. A submission by the lobby group, which represents more than 1,300 companies, also expresses concerns about widespread disruption during construction and delays that could push completion of the project out to 2040. A US military aerial refuelling aircraft has made an emergency landing at Shannon Airport this afternoon. The US Air Force McDonnell Douglas KC-10 is believed to suffered a problem with one of its engines over the Atlantic. The crew declared an emergency reporting they had shut down one of the jet's three engines. There were nine crew members on board. 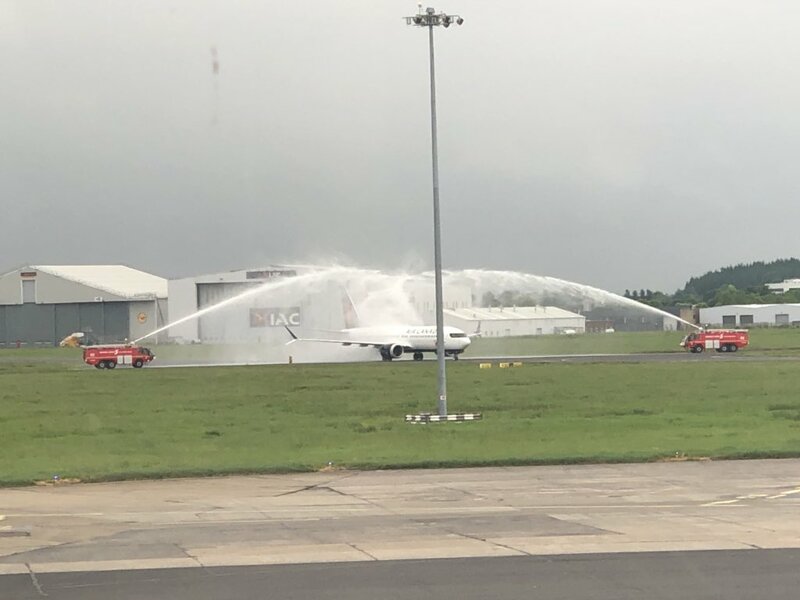 Five units of the fire brigade from Shannon Town were sent to the scene in support of the airport's own Fire and Rescue Service. MEP Deirdre Clune has written a strongly-worded letter to the CEO of airline Norwegian, asking him to reconsider the decision to axe the Cork-US flights next winter. Last month the airline announced it was to axe the year-round link to Boston/Providence from October and operate for the summer only next year — March to October. However, in the letter to Bjorn Kjos, whom the Irish MEP has met at the European Parliament and at Irish Aviation Authority meetings, Deirdre Clune has appealed for the Cork-Providence flights to be reinstated and to enable bookings as soon as possible for Summer 2019. Aer Lingus could do SIN/BKK just fine. Maybe not with the A330s, but if they're waiting a while for the 359s they could simply lease a few planes. They lease four 752s off ASL, and they've previously leased 767s off Omni, so why not? Omni Air has 772s and HiFly has A343/5s, with IAG backing they could afford this no problem. Although maybe I'm being naive, A340s and 777s are large ULH aircraft, there's only a few stands at DUB can take them to the best of my knowledge. Also DUB has (for now) a short runway, and these planes may not be able to fly that distance direct from DUB at MTOW. ( Shannon Stopover? ). But EI could fly 332s to NRT, ICN, PEK and PVG. Ryanair said its passenger numbers grew by 6% to reach a total of 12.5 million in May. The airline's load factor - who many seats it fills on each flight - rose by 1% to 96% last month. Pity this weekly flight only operates on a handful of weekends during the summer! Dublin Airport is to trial a new, honesty-based food and drinks take-away fridge, testing the virtue of passengers. However, unlike the airport’s honesty payment system for bottled water, where passengers are simply asked to put a euro in a box when they take a bottle, this time around there is a catch. The CSO has recorded an increase in passenger numbers at Shannon Airport in the first three months of this year. Just over 277,000 people flew through the Airport between January and March – that’s up by over 5,000 on the same time last year, but is a reduction of a similar amount when compared with 2016. Shannon has also recorded 150,000 fewer passengers than Cork Airport in the same timeframe, but Airport management have previously pointed out that the CSO figures don’t take transit passengers into account. Does anyone have the EI flight numbers and schedule for the DUB-DXB service? Also can anyone remember when it operated to and from? Around 2006 . Flights were re timed but at some point operated DUB-DXB 11:00/21:30 and DXB-DUB 00:20/05:20 . Im sure someone else can add more details. Aer Lingus put an end to months of speculation by finally suspending its ailing flights to Dubai in favour of extra flights to existing US destinations. Announcing the move, the company said the switch had been made because of "significant demand" for US flights. Dubai's axing had been widely rumoured, but Aer Lingus insisted the two-year-old route was merely suspended from March, while "potential operations to Dubai on a seasonal basis remain under review". Aviation sources, however, said the route was effectively dead and buried. Dubai was Aer Lingus' first venture east, the airline's only venture outside the US, and one of the first routes announced under the stewardship of chief executive Dermot Mannion. When details of the route's poor performance first emerged, the aviation industry was highly critical of the airline's failure to make a go of it. However recent reaction to the move was more positive. Looks like the flight numbers were EI 001 and EI 002 . Ex DUB TUES THURS SAT . Started 29/3/06 . I had no idea how competitive going via DUB could be on BKK - East Coast USA routes. That, combined with potential feed from the likes of MAN (with no BKK flight) should help. However, I really question if the 332 can do DUB - BKK - it's 1,000 mi longer than to LAX. DUB's runway length really affects the performance of the 332 on such long flights, right?